I've found many excellent games through geeklists like this one, so I reckon it's time for me to give something back to the community. I'm always on the look-out for good abstract games, so additions are most welcome. Go... Where to begin? 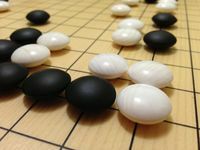 Go is the perfect marriage of strategy and tactics, where losing a battle may mean winning the war, and vice versa. It's more than two and a half millennia old, yet it's basically an abstraction of modern warfare. It's a highly confrontational game, yet it invites to silent contemplation. It's aesthetically minimalistic, yet it's the most beautiful game you ever saw. An abstract game about loops and lines, with rules that can be printed on a postcard, an average playing time of 10 minutes, and pieces which are completely identical — number two on a top 10 list of abstract games? Yes, indeed. Despite its simplicity, Trax has surprisingly much depth, and it's certainly not easy to master; it's quite possible the game with the best simplicity-depth ratio I've ever played. There are few, if any games which can match this minimalistic elegance; it even beats Go in this respect. However, the main reason I love this game is that it has a quality that few abstract games have: it's playful. It's fast and intense, and a single blunder may mean demise and you're often your own bane, so there's often laughter around the table. Incredibly enough, Trax has excellent replay value too; I can literally play it dozens of times in an evening without it ever feeling repetitive. Always a pleasure to play this game. Until very recently, Kamisado was more or less cemented on this position. However, I've fallen hopelessly in love with this Icehouse game. As a matter of fact, Volcano may possibly continue to climb on my Top 10 List; I need to play it more before I can say this for certain, though. Anyhow, this is a brilliant abstract game, in my humble opinion. Just like Go and Trax, Volcano has a fantastic simplicity-depth ratio. The game is very easy to learn — takes a minute or two — but certainly not as easy to master. The main mechanism, which basically is the only mechanism, doesn't resemble anything else I've seen; in lack of a better word, I'd describe it as a cascading mechanism. To play the game is a highly aesthetical experience for me too. Not only do I appreciate the minimalistic beauty of Icehouse pyramids, but I also play on a light board — perhaps better described as a glowing board — which I've made myself, and it looks absolutely magical. Kamisado is a bloody marvelous game, which you simply must try if you like abstract games. The gameplay doesn't resemble anything I've encountered so far; the pieces and the squares on the board are colour-coded, and the square you end your movement on decides which piece your opponent must move. At first, it's quite confusing, but once you master it, it's very entertaining. I usually play Kamisado quite casually, but it's possible to calculate very long and complicated combinations; I'd say that Kamisado is an equal to Chess in this respect. 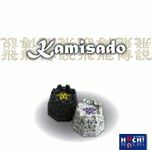 Kamisado lacks the complex interplay between strategy and tactics that can be found in Go, but it's not far behind this classic game on my rating list. I should also mention that Kamisado is an aesthetically original game; the pieces are quite possibly the most beautiful ones I've ever seen in an abstract game. TAMSK was originally part of GIPF Project; it still says that is so on my box. All of the GIPF games offer original gameplay, but TAMSK is probably the most original. Essentially, it's a matter of area control under time pressure. Your pieces are sand timers, and when you move a piece, it must be inverted, and if you run out of sand, it's lost and can't be moved anymore. There are so many interesting aspects of the gameplay that I don't really know where to start. Obviously, time is of the essence, and you can use it to your advantage. For instance, if your opponent is running out of sand in a timer, you make an advance in another area and force your opponent to either give up ground or lose a timer. I could make a long list of other examples, but I leave it to you to explore the many interesting aspects of this game yourself. This game might very well climb on my list. It's a pity that this game is becoming increasingly difficult to find, because I think it's one of the most fascinating abstract games ever made. Below the top 5 games, it becomes more difficult to rank the games between themselves. No game stands out from the majority as clearly as the games above. With some hesitation, I rank Ponte del Diavolo as #6. Essentially, it's a game about network building: you build sandbanks and islands and connect them with bridges; the more islands you connect, the more points you get, and it's exponential. This may sound simplistic, but since it's very easy for the players to block each other's moves and isolate each other's islands, the game becomes a fierce battle over territory. I've only scratched on the surface of this game, but I'm already very fond of it. I think Ponte del Diavolo's take on the combination of network building and area control is original, and it forces me to think in new ways. I'm still a bit uncertain how deep the game is, and how good the replay value really is, but I enjoy playing the game for sure. It's no secret that I'm a big fan of Reiner Knizia. Almost invariably, Knizia's games are streamlined, interactive, and fast; they have simple rules, yet suprising depths. Callisto is quite possibly Knizia's most Knizian game. In any case, I dare say it's one of his most streamlined games, because the rules can easily be explained in half a minute, at least to a seasoned gamer, yet it's surprisingly deep and thinky for what it is. 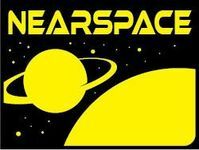 I dare say it's one of Knizia's most interactive games as well, because there's fierce competition about space on the board. It's also quite fast, taking 20 minutes, often less, depending on how experienced the players are. Callisto is my game of choice nowadays if I want to play an abstract game with more than two players. 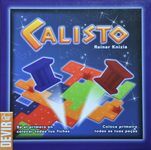 Previously, it was Ingenious, which I also think is an excellent game, but Callisto has simpler rules, plays faster, and has no luck factor; yet it's basically as entertaining and stimulating as Ingenious. I'd also say that it quite possibly is the best abstract, so-called gateway game I've played. It seems that I very well might be the only one, but PÜNCT is my favourite among the official games in GIPF Project. At first glance, it looks like a simple connection game, but as the cliché goes, there's more than meets the eye. There are a few elements that distinguish PÜNCT from all (?) other connection games: 1) Unless blocked by an opponent's piece, you can move a piece after it has been placed on the board, and the pieces are moved in a very unusual way, governed by a coloured point on each piece, called a Pünct. 2) There's a kind of layering mechanism in this game: You can block your opponent's pieces as well as cut off and bridge their chains by placing your pieces on top of them; obviously, so can they in turn. 3) The board is hexagonal, and you win by connecting any two sides which are opposite each other. The above mentioned elements add interesting spatical aspects to the game; I haven't experienced anything like it in another game. I, for one, have to think in completely new ways when I play this game, and that's both stimulating and refreshing. I think that PÜNCT definitely deserves a little more attention and recognition. The only weakness of the game is that it's not as aesthetical as the other games in the Gipf Project. GIPF was my first contact with the GIPF Project and it was quite a relevation. Before that, I had only played classic abstract games like Chess and Go, so GIPF felt very different. 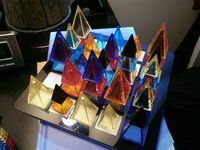 The odd hexagonal board and equally odd pushing mechanism made me see abstract games in a new light: as games of the modern age which can be highly innovative and force you to think in new ways. Ironically, GIPF made me more interested in abstract games as a category than in GIPF itself. GIPF has climbed on my list, though. The reason is that until rather recently, we only played with the basic rules, i.e. without Gipfs. Playing with Gipfs adds a whole new dimension to the game and makes it more strategic, intricate and intense. GIPF may not be the deepest game on this list, but it's certainly an original game and also a good, so-called gateway game to abstract games in general and Project GIPF in particular. 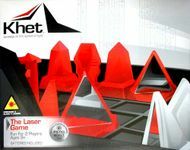 Had it not been for the copycat game Laser Battle, Khet would have been a completely unique game. In essence, you try to move and rotate mirrors in order to direct your laser beam — it's actually a real laser beam — around the board and get a clear shot at your opponent's Pharaoh, the equivalent of the king in Chess. Khet may seem a little bit gimmicky, and perhaps it is, but it can in any case be very enjoyable. It may seem simple too, but Khet really challenges your spatial intelligence. It can be a rather intense game, because if you don't pay attention, the game can end very quickly — suddenly, your Pharao is glowing red. Every game of Khet ends with either laughter or groaning. Khet isn't necessarily a very deep game and it doesn't necessarily have as good replay value as most of the other games on this list, but I appreciate the sheer originality of the game and it's certainly entertaining to play. It's not a bad so-called gateway game either. Ingenious: I think this is an absolutely charming Knizia game, and I really like the scoring á la Tigris & Euphrates. Had it not been for Callisto, it would definitely have made it to the list. Through the Desert: Although this game is vaguely topical, I think it's safe to say that it's an abstract game. I've always been very fond of it, and a year or two ago, it would have had a given place on my top 10 list. I'm still very fond of it, but the replay value is unfortunately not as good as I thought it would be. Fealty: This game is arguably not a proper abstract game; there's a high degree of abstraction, but it is clearly topical. Be that as it may, Fealty is a sadly ignored and forgotten game, and I think it's simply because the pieces are made of cardboard and the boards aren't very aesthetical. It's a pity, because it offers unique (?) gameplay and scales brilliantly with 2, 3, and 4 players. If I would have made a top 20 list instead, Fealty would most definitely have been #11. Chess: I've played this classic game ad nauseam, but I can still find a casual game of Blitz Chess highly entertaining. It's a very rare occurrence, though. The Duke: A new acquaintance. It's a very original and dynamic game in many respects, but it reminds me a little bit too much of Chess to ever reach my top 10 list. ZoxSo: A quite brilliant brain burner; few games force me to think as hard as this one. It reminds me a tad too much of Chess and there's a possible starting player issue, otherwise it would most definitely have been on my top 10 list. If I would have made a top 20 list instead, ZoxSo would probably have been #12. TZAAR: TZAAR is a great game, but of the games in GIPF Project which I've played so far, it feels like the least enjoyable one. As I see it, there are only two modes: either you play casually and experience pure chaos or you play seriously and suffer analysis paralysis. For The Win: Although one may claim that this game has copied much from the original, I tend to prefer For the Win to Hive. It may lack the purity and elegance of its predecessor, but I think it's more varied and dynamic, and hence more entertaining. Another advantage with For the Win is that there's a 3-4 player expansion; this was a Kickstarter promo and it's probably not readily availabe in stores, unfortunately. Anyhow, with 3-4 players, the game really becomes interestingly intricate. Senet: This is, arguably, not a proper abstract game. Luck is just as important as skill, if not more important, and there's not much depth to speak of. However, I think it's perfect as a casual café game; it beats Backgammon by far, in my opinion. I also find the ancient Egyptian elements fascinating, such as the use of sticks instead of dice, and the mythological symbolism of the iconography. Note: I consider Tigris & Euphrates to be a topical game and not a real abstract game; otherwise it would have been #2 on my top 10 list.